On March 7th (2019) the Newsroom of The Church of Jesus Christ of Latter-day Saints posted what it called an “unprecedented video production within one of the Church’s most sacred spaces.” This video is a virtual tour of the church’s new temple in Rome, Italy. 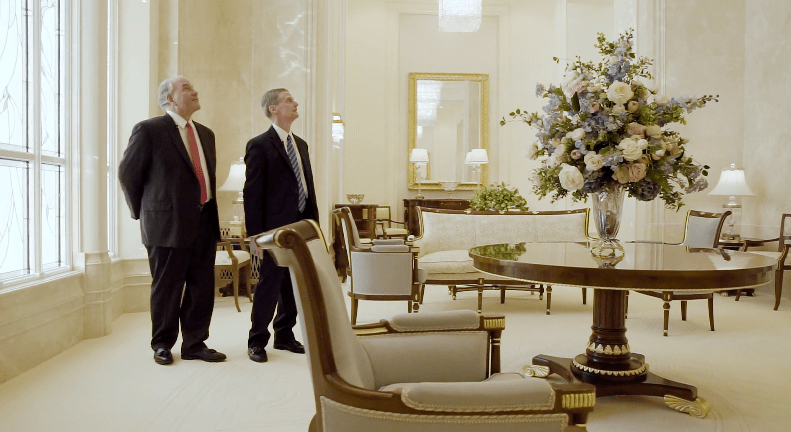 Led by two Mormon apostles, David Bednar and Ronald Rasband, viewers get a look at several areas within the temple accompanied by short explanations from these church leaders. I was not able to visit the Rome temple in person, but I have been to many other LDS temple open houses. My impression of the virtual tour video of the Rome temple is that, much like a live temple tour, by the end of it people have little understanding of what they’ve seen and even less insight into the unique teachings of Mormonism. The virtual tour of the Rome temple is rather misleading. Generally, this is not due to overt misinformation (for an exception, see Ronald Rasband’s assertion that “Baptism for the dead was taught by the apostle Paul in the New Testament” at 3 minutes and 13 seconds). Rather, the viewer is misled via significant omission. Beyond omitting certain rooms from the tour of the temple and neglecting to mention, for example, the temple ordinance of washing and anointing, or key words, signs, and tokens which are such an integral part of the endowment ordinance, the whole temple tour experience for non-Mormons begins and progresses while rooted in a fundamental misunderstanding. The video tour beings with the Mormon Prophet-President Russell Nelson extending a welcome to visitors, explaining that “a temple is literally a house of the Lord.” But never during the entire tour is it explained that the God whose “house” this is, is not the God non-Mormons assume He is. The omission of this information leads to a fundamental misunderstanding of each ordinance, each explanation, and each declaration made by the apostles as they lead the virtual tour. If viewers/visitors knew that the LDS view of God the Father requires that Mormonism’s Heavenly Father was once a mortal man living on another world, who Himself needed to go to a temple, to receive instruction and make covenants with His God, in order to achieve the heaven represented by the temple’s celestial room, the whole temple tour would make a lot more sense. And the church would also be providing a much truer demonstration of what LDS temples are actually for. I think it would be of great value for visitors and viewers to approach their temple tour with this fundamental knowledge about the God of whom the LDS leaders speak. This information could easily be incorporated into temple tours by, for example, restructuring the tour to be a narrative that follows Mormonism’s Heavenly Father (while he was yet mortal) through His own temple ordinances. What would that kind of temple tour look like? I’ve edited parts of the narration of the church’s virtual tour video to reflect this idea. As you read on, please note that the editing (primarily of tenses and personal pronouns), as well as any additions to the Mormon apostles’ actual words, are presented in italics; everything in this proposed tour is consistent with official LDS teachings. Russell Nelson: Each temple is a holy sanctuary in which sacred ceremonies and ordinances of the gospel are performed, by and for the living, and also on behalf of the dead… In this recording…you will hear from two apostles of the Lord about promises that the man who became our Heavenly Father (that is, our God) made there to become a better person by following His Lord and Savior. Ronald Rasband: Heavenly Father would have come here to a recommend desk, like members of our church do today, and He would have been met by two temple workers who were wearing white suits. And He presented a small card called a temple recommend. The card was issued by His local church leaders, affirming that Heavenly Father was prepared to participate in these sacred ceremonies of the temple. David Bednar: Baptism by immersion for the remission of sins is an essential saving ordinance of the gospel, one which Heavenly Father necessarily received on His way to becoming a God. Ronald Rasband: And here in the temple, we do baptisms for the dead… it is almost certain that Heavenly Father was also baptized for His departed ancestors. 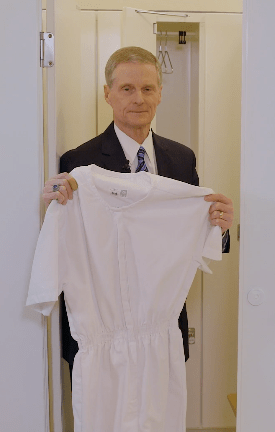 David Bednar: When Heavenly Father came to the temple to perform baptisms for the dead, he… would come to a dressing area like this, separate area for the men, separate area for the women… And He would dress in this kind of clean, white clothing. Ronald Rasband: In this room, Heavenly Father came to prepare to go through the ordinance sessions… He came into the chapel dressed in white, which created a sense of unity and reminded Him that we are all equal before His God. Now, there’s beautiful artwork in the chapel, there’s soft music that might be playing in the background, all enabling Heavenly Father to have a quiet spirit and contemplative time before going through His ordinance sessions. Ronald Rasband: In an instruction room Heavenly Father learned about the plan of happiness. And He learned about His God’s purpose for Him there in mortality. He was also able to make special covenants with His Lord about His journey throughout life. David Bednar: A covenant is a pledge, a promise, and a commitment to God. And here, as a part of the endowment, Heavenly Father pledged that He would obey His God’s commandments, that He would be selfless, that He would live a clean, pure and chaste life, and that He would develop and dedicate Himself to His God’s holy purposes. Ronald Rasband: We have just come from the first instruction room, where, in the temple that was used by Heavenly Father, the walls were painted in beautiful murals of the mortal world in which He lived. He progressed into this instruction room… that is lighter, brighter, and gave Him a sense of His progression through life. David Bednar: Heavenly Father’s progression was made possible because of honoring the covenants that He entered into in the previous instruction room, and because He also received all those temple ordinances which were necessary for Him to enable Him to walk back into the presence of His Father, passing the angels who stand as sentinels, being enabled to give them key words, the signs, and tokens, pertaining to the Holy Priesthood, and gain His eternal exaltation, just as the introduction to the temple endowment ceremony explains. David Bednar: Those who inherit the highest degree of the celestial kingdom, who become gods, must also have been married/sealed for eternity in the temple [ibid.]. The word ‘sealing’ can be equated to a marriage that is ever-binding or put together permanently. At an alter like this, our pre-deified Heavenly Father and Heavenly Mother knelt, taking each other by the hand, and by the authority of that holy priesthood power, they were sealed as a husband and a wife. And because they have been true and faithful to the covenants they have entered into in the temple, then Heavenly Father’s marriage lasts, not just till death do they part, but for all of eternity. This great power connects all generations as, for example, Heavenly Father’s children and parents were also sealed together as families for eternity. Doesn’t this imaginary temple tour shine a brighter light on LDS temples? Wouldn’t such a tour provide non-Mormons with a much better understanding of LDS temples as well as some of the unique teachings of this church? To understand Mormon temples and to understand Mormonism, we must first understand the god who is the foundation of it all. This is what Mormon temples are all about — providing what the LDS church believes is necessary to enable human beings to become Gods, the same as all Gods have done before. This is how Mormonism’s God came to be God, and it is how mortal Mormons today must become Gods themselves. This is what visitors to LDS temples need to know: Beyond all the window dressing of apostolic statues, paintings of Christ, and biblical-sounding language, these temples are first and foremost grand monuments to a different God. The Being of God as He has revealed Himself in the Bible is vastly different than the Mormon view. In the Bible we learn that God is eternally God; the only true God, past, present and future; transcendent and unique; Creator of all, subject to none. This does not equate with Mormonism’s God who was once not a God, who is one of many Gods in a line of Gods that stretches back (and potentially forward) into eternity, who is a creator of some things but not all, and is subject to another God who is ahead of him in line (who, by the way, is subject to yet another God, and so on). Joseph Smith and Jesus Christ agreed on this: Eternal life is knowing the only true God (John 17:3). Which one will you choose? The unique God-man promoted in Mormon temples? Or the Almighty and gracious God of the Bible who, according to His own mercy, holds out before you His gift of forgiveness and eternal life (see Titus 3:4-7)? When the last trumpet sounds, may we each be found wholly devoted to the one and only true God.